The Apex Model Edge Pro is a patented system that will sharpen any size or shape blade (up to 3.5″ wide), including serrated knives. Knives can be sharpened at exactly the same angle every time, making re-sharpening so fast you will never work with a dull blade again. Our water stones have been custom formulated to free you from messy, gummed-up oil stones. They last a long time and are inexpensive to replace. The Apex will remove far less metal than electric sharpeners or grinders, eliminating wavy edges and adding to the life and performance of your knives. The Apex removes nicks and dings without distorting the knife edge. It creates no heat, preserving the temper of your knives. It sets up in seconds on any smooth surface. No power required and comes with a convenient carrying case. Requires no maintenance other than routine cleaning. Patented Knife guide system does not clamp the blade, so you can sharpen any length or shape blade up to 3 ½” wide. Adjustable sharpening angles, from 10, 15, 18, 21, and 24 degrees and infinitely in between. Manufactured from the highest quality materials in Hood River, Oregon, US. The Apex Knife Sharpening System is manufactured in Hood River, Oregon and it is available in four different models ranging from a basic starter kit to a complete kit with many of the accessories that are available included. The Apex 1 Kit is the most basic kit that includes both 220 and 400 grit water stones, a small water bottle, a microfiber cloth, a manual, and a rugged Cordura nylon carrying case. The Apex 2 Kit builds on the basic kit by adding a 600 grit water stone, an 8″ ceramic hone and a DVD. The Apex 3 Kit builds on the Apex 2 Kit by adding an extra-coarse 120 and extra-fine 1000 grit water stones. The most complete kit is the Apex 4 Kit which builds on the Apex 3 Kit by adding 2000 and 3000 grit polishing tapes, and two polishing tape mounting blanks. The body of the Apex Sharpening System is made from a high quality Nylon 6 (polycaprolactam) for its strength and durability. It is moulded into a reinforced L-shaped platform capable of supporting most blade sizes and shapes up to 3.5″ wide with an adjustable brace designed to stabilize the blades as you sharpen them. Additionally, you can get a Small Knife Attachment that provides more control and flexibility when sharpening smaller knives. The two front legs are retractable so they fold away for easy storage. The two rear feet are suction-cups designed to prevent the Apex unit from sliding around your workspace while you are sharpening knives. However, if you don’t have a table or workbench that will allow the suction cups to stick, you may need some type of glass base to fix the unit to. Edge Pro provides a 12″ diameter glass disc with a non-slip protective rubber molding around the outer edge as part of their Stone Leveling Kit that works perfectly for this. The patented steel guide system is fully-adjustable with vibrant-colored markings at 10, 15, 18, 21, and 24 degrees so they are very easy to see. The guide rod is designed with safety stops that prevent the stones and plates from going past the blade which also keeps the round-knobbed handle from getting to close to the blade’s edge. Over the last 35 years, they have tested hundreds of different sharpening stones, narrowing the selection to the five stones that they currently provide. But they are always on the lookout for better stones as they become available. The Edge Pro water stones are made from high-quality artificial bonded abrasives. The coarsest stone is 120 grit and it consists of silicon carbide (carborundum) for its fast-cutting properties. However, it does not finish well so it is not the best choice for the finishing stones. The 220, 400, 600, and 1000 grit water stones are made from aluminum oxide (corundum) which provides a finer finish. Additionally, Edge Pro water stones are specially formulated to resist excessive wear and gumming up with sludge. Water stones can be used dry. However, it is highly recommended to wet them thoroughly prior to use for them to last and work optimally. They need to be well-lubricated to keep the pores of the stone free from clogging by lifting the swarf and turning it into a slurry. It also cools the edge of the blade during the cutting action which protects the temper of the blade. Water with a small amount of liquid soap further enhances the lubrication properties of water alone. Each Edge Pro kit comes with a small water bottle just for this purpose. Tip: Water stones can be cleaned with soap, water and a nylon bristle scrub brush. Each Edge Pro water stone comes securely attached to a 1″ x 6″ aluminum plates that are designed to fit perfectly between the two stone mounting brackets attaching the water stones to the guide rod. A simple twist of the knob on the end of the guide rod locks and unlocks the aluminum plate in place. In addition to a solid attachment platform, the aluminum plates also provide the rigidity necessary to keep the water stones from flexing which could cause them to break. For sharpening recurved blades, the 220, 400, 600 and 1000 grit stones are also available in 1/2″ widths so they can get into tighter areas than the 1″ stones. Edge Pro water stones typically last a very long time and can be resurfaced as necessary to keep them flat and optimally sharp, and when they become far too worn to work effectively, they are somewhat inexpensive to replace. You can also purchase third-party stones from various online sources. There are literally hundreds options available including diamond-dust plates, leather and balsa strops, and even stones with grits as high as 30,000. However, the quality of the third-party stones may vary greatly. Polishing tapes are used to provide a highly-polished finish over and above what the water stones can provide. The Apex 4 kit includes 15 polishing tapes in both 2000 and 3000 grit. To use them, simply stick it to one of the 1″ x 6″ aluminum mounting blanks which provide a hard flat surface and use it just as you would a water stone. Two blanks are provided with each Apex 4 kit, but you can always purchase additional blanks separately. Furthermore, you can also purchase 6000 grit polishing tapes separately. 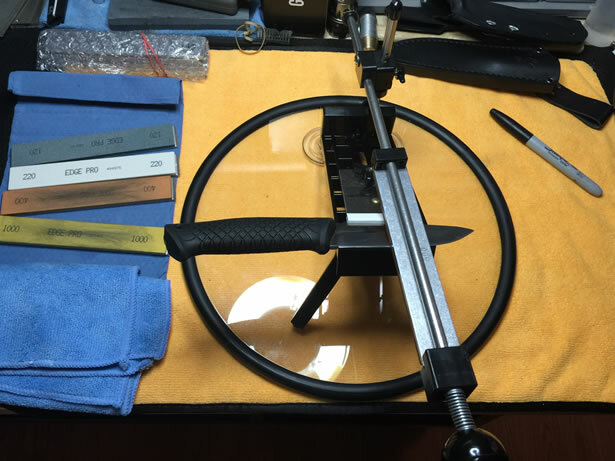 Most of the Apex kits also include a 5/16″ white 1200 grit ceramic honing rod with a nylon rubber handle approximately 8″ long for sharpening recurved blades, serrated edges and any other blades that require a quick tuneup. Edge Pro also sells 1200 grit ceramic honing rods in 10″ and 12″ lengths with a wooden handle directly from their website. Tip: Ceramic honing rods can be cleaned with soap and water, but they are best cleaned with a soft gummy rubber eraser. When not in use, the Apex kits fold down to fit in a convenient heavy-duty black cordura nylon carrying case. It has three pockets to keep the kit organized, each with a velcro closures to securely hold everything in its place. The Apex Sharpening System requires no maintenance other than a routine cleaning. Only the stones and polishing tapes themselves require maintenance and occasional replacement. Some of the accessories that are available for the Apex system, but are sold separately include a spring that replaces the spacer on the guide rod becoming a quick-change mechanism for the water stones and polishing plates. There is a strong magnet also available that can be added to the base to assist in hold the blades in place. Another very important accessory to have is a 5/16″ clamping collar that assists in keeping the angle correct between stones with varying thicknesses. Additionally, there is an attachment available from Edge Pro for sharpening scissors as well. Water stones can easily be leveled and resurfaced if you have one of the Stone Leveling Kits. You simply pour a small amount of the 60 grit silicon carbide and add a little water to the surface of the glass disc followed by moving the selected stone in a circular motion over the silicon carbide until it is completely flat as demonstrated in the videos provided on the Edge Pro website. You can also use the back side of a large flat ceramic tile, a flat section of concrete, and even a diamond-dust embedded steel plate to resurface the stones in much the same way. Since Edge Pro has so many great videos demonstrating how to use the Apex Sharpening System on their website, I figured that I really didn’t need to reinvent the wheel allowing me to focus on documenting the steps that I took and the results that I achieved, in addition to discussing any tips that I learned and pitfalls that I had to overcome along the way. 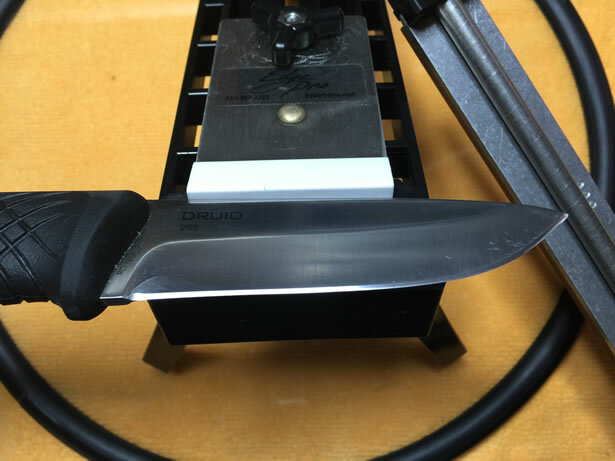 Just the other day I finished with a review of the Steel Will Druid 265 and found that the blade needed a tuneup after all the testing that I put it through so I thought this would be a good opportunity to do so. It is a medium-sized bushcraft knife with a 4″ blade made from 9Cr18MoV high carbon stainless steel with a high-flat saber grind and a micro-beveled edge. Perfect for demonstrating the Apex system. Tip: To prevent any damage to the finish of the blade, simply apply a thin layer of blue masking tape covering the entire surface of the knife with the exception of the beveled edge that will be sharpened. Since I already had a few scratches in the finish of the blade that I planned to buff out later, I decided not to bother taping it up. Actually I was so excited to get started that I forgot to do it. After setting up the Apex sharpener on my workbench, the next thing that I needed to do was to find the bevel angle of the blade. 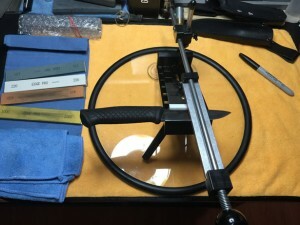 This is a very important step unless you are reprofiling the blade with a new bevel angle. To do so, I colored a section of the beveled edge with a permanent marker before drawing a stone across it. You want the color removed evenly across the entire beveled surface. If the front edge of the color is removed, then the angle is set too high. If the trailing edge of the line is removed, then the angle is set too low. Unless you are reprofiling the edge due to rolling, chipping, or to simply change the bevel angle, you would likely skip the coarser stones and go directly to the 400 grit stone. However, if you are reprofiling the edge, the 120 grit stone would be the best stone to begin with. Tip: Once you find the correct angle and it is locked into place, set the 5/16″ collar below the guide rod angle adjustment the exact thickness of the stone that you are currently using. This will provide a valuable reference point as you cycle through each stone, strop and polishing tape if you use them. If you don’t have one… Get one. They cost less than $4 and it’ll save you hours of time and tons of stress. 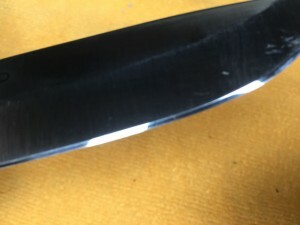 After setting the collar with the 400 grit stone and attaching it to the guide rod, I proceeded to wet the stone thoroughly and begin sharpening the blade. I rested the blade on the platform with one hand and worked the knob on the end of the guide rod with the other as I began polishing the edge. I started off with about 15 strokes on each side of the blade, slowly dwindling down until I hit one stroke per side leaving the burr as small as possible before wiping the blade down to remove the slurry. Once both of the beveled edges were evenly colored it was time to move on to the next stone. Tip: It is possible to soak all of the stones into a container of water with a touch of liquid soap prior to use rather than using the water bottle to wet them. In most cases it is perfectly fine to skip the 600 grit stone and go directly to the 1000 grit stone. However, this time I decided to continue on with the normal process stepping up to the 600 grit water stone. After adjusting the angle and swapping stones in the guide rod and getting it completely wet, I continued polishing the blade with 15 strokes on each side, and within 2-3 minutes I was already down to a single stroke per side. Again, you keep working on each side until both edges are evenly colored. Although, by the time you are finished with the 600 grit stone, that color should be a somewhat mirrored finish. For the next step in the process, I continued refining the edge with the 1000 grit stone. Just as before, I adjusted the angle, swapped the stones, and wet it before continuing to polish the edge. As soon as it was wet enough, I immediately started with 15 strokes per side, gradually working my way down to a single stroke. By this time, I was looking for a consistent mirrored finish down the entire edge. Testing the edge on a single sheet of computer paper, it was able to slice through cleanly without any drag. However, the knife was not quite sharp enough to shave with yet. Tip: When using the polishing tapes, always use a reverse motion like you would a strop for the first few strokes to prevent cutting the tapes with a heavy burr. You could certainly stop at this point and have a sharp knife, or you could continue to refine the edge until it was sharp enough to shave with. I decided to go ahead and continue with the 2000 and 3000 grit polishing tapes. They are used in exactly same way that you would use the wet stones, but you need to be careful not to cut them with the edge of the blade. By the time I was finished with both tapes, the beveled edge had a mirror finish and it was definitely sharp enough to shave with. I only wish I had a strop handy so I could take it a little further. The Edge Pro Apex Sharpening System is a high quality knife sharpening solution designed to simplify the process and provide consistent results every time. This is certainly the most attractive benefit of the Apex system. The complete control over the angle and the consistency that it provides is nothing short of phenomenal. This is one area that has always plagued me with freehand sharpening solutions, but it comes at a premium and it may be priced to high for the casual user. The target audience for a sharpening solution of this nature are professionals, enthusiasts and avid collectors. Casual users would likely find it too expensive and opt for less expensive solutions. Additionally, there is a wide variety of accessories, stones, strops and other polishing options that undoubtedly provide a substantial benefit to anyone using one of the Edge Pro solutions. No matter which Apex model you purchase, I found the 5/16″ clamping collar and Stone Leveling Kits indispensable making the entire system much easier to use accurately and efficiently. I have many knives that I’ve had trouble sharpening over the years. This is mostly due to bad habits and lack of practice resulting in having turned many a knife’s edge into a wavy mess. However, I really hate the idea of altering a blade geometry just to sharpen it conveniently. Sharpening solutions that alter the grind by turning them concave or convex destroy true flat and Scandinavian grinds making their bevel nearly impossible to recover without removing enormous amounts of material and reducing the overall life of the blade. Why buy a Scandi-ground blade only to sharpen it with a sharpening solution designed to sharpen a convex edge? It makes no sense to me. 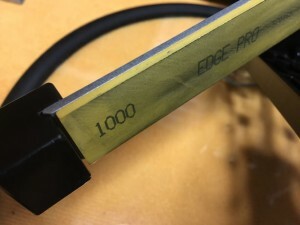 Edge Pro’s solutions tend to remove far less material than electric sharpeners, sanders and grinders, and they virtually eliminate wavy edges with inconsistent beveled angles created with unsteady hands on freehand solutions. The Apex sharpener has virtually eliminated the lack of control over the blade by providing a stable, accurate and controllable guided platform that I can finally achieve consistent results. For me, it is worth every penny… Two thumbs up! I am already planning to pick myself up a strop and a few higher-grit Chosera stones in the very near future taking this kit to the next level. I want wickedly sharp! In 1980, Ben Dale the President of Edge Pro fell into a job as a professional knife sharpener. He immediately began developing a jig to make sharpening knives easier and more efficient. After 10 years of development, more than 100 prototypes, and over 100,000 knives sharpened, Ben moved to Hood River, Oregon and started Edge Pro where he immediately began building and selling the Professional model. Four years later, Edge Pro released the Apex model to the public. Twenty-five years later, Edge Pro has eight employees and they still make all but a few parts locally at their factory in Hood River, Oregon. Any parts that they do source all come from US companies. In 2012, the second Edge Pro employee, Cody Kendall, the Operations Manager purchased Edge Pro and runs it today. Ben Dale is still with Edge Pro, though he is not full time anymore.